Received May 15, 2018; Accepted August 14, 2018.; Published online October 1, 2018. The CRISPR-Cas system is a well-established RNA-guided DNA editing technique widely used to modify genomic DNA sequences. I used the CRISPR-Cas9 system to change the second and third nucleotides of the triplet TCT of human TNSFSF9 in HepG2 cells to TAG to create an amber stop codon. The TCT triplet is the codon for Ser at the 172nd position of TNSFSF9. The two substituted nucleotides, AG, were confirmed by DNA sequencing of the PCR product followed by PCR amplification of the genomic TNFSF9 gene. Interestingly, sequencing of the cDNA of transcripts of the edited TNFSF9 gene revealed that the TAG had been re-edited to the wild type triplet TCT, and 1 or 2 bases just before the triplet had been deleted. These observations indicate that CRISPR-Cas9-mediated editing of bases in target genomic DNA can be followed by spontaneous re-editing (correcting) of the bases during transcription. Programmable nuclease-based genome manipulation techniques have been extensively studied and improved (Baltimore et al, 2015; Bibikova et al., 2002; 2003). These techniques are critical tools for biomedical research and may lead to management of many human genetic diseases by genome cleavage and/or editing. Early genome-editing efforts exploited endogenous homologous recombination, zinc-finger nucleases (ZFNs) and transcription-activator-like effector nucleases (TALENs) (Bibikova et al., 2002; 2003; Boch et al., 2009; Li et al., 2011a; 2011b). Although significant progress has been made by developing new programmable nucleases, many challenges remain, including improving the efficiency of genome editing and reducing off-target effects (Choulika et al., 1995; Jeggo, 1998; Lin et al., 1985). These challenges have been partly overcome by new genome editing technologies based on the RNA-guided DNA endonuclease of the CRISPR/Cas system (Cong et al., 2013; Garneau et al., 2010; Gasiunas et al., 2012; Jinek et al., 2012; Koo et al., 2015; Mali et al., 2013). CRISPR/Cas was originally discovered as part of a bacterial “immune system” (Garneau et al., 2010; Gasiunas et al., 2012; Jinek et al., 2012). The endonuclease activity of Cas protein complexed with a “guide RNA” produces double-stranded break (DSB) between certain bases in a target genomic DNA sequence complementary to the guide RNA (Doudna and Charpentier, 2014; Hsu et al., 2014). A genomic DNA sequence targeted by Cas should contain both a DNA sequence (“protospacer”) that will base-pair with the guide RNA, and a short DNA sequence called the “protospacer-adjacent motif (PAM)” (Deveau et al., 2008; Garneau et al., 2010). Many Cas proteins have been identified or engineered and each requires a specific PAM (Komor et al., 2017). RNA-guided DNA cleavage can lead to either non-homologous end joining (NHEJ)-induced random insertions and deletions (indels), or DNA replacement via homology-directed repair (HDR) in the presence of donor DNA. Mutated or engineered Cas proteins have been developed to reduce the off-target activity of Cas (Komor et al., 2016; Ran et al., 2013). TNFSF9 encodes the CD137 ligand (CD137L, also known as 4-1BBL). It is a member of the TNF family and is generally expressed on antigen-presenting cells and tumor cells (Wang et al., 2009). CD137L binds to CD137, a TNFR family member, on T lymphocytes, and produces CD137 signals-mediated costimulatory responses in T cells (Lee et al., 2002). Binding of CD137L by CD137 also elicits reverse signal transduction pathways and modulates innate immune responses (Kim et al., 2009; Shao and Schwarz, 2011). Recently we reported that CD137L reverse signals interact with lipopolysaccharide (LPS)-induced Toll-like receptor 4 (TLR4) responses in myeloid cells in complexes of CD137L/TMEM126A/TLR4 (Kim et al., 2015). In this study, with the aim of examining the real-time localization of endogenous CD137L, we used CRISPR-Cas9-mediated gene editing in HepG2 cells to mutate two nucleotides of TCT encoding the 172th amino acid (Ser) of human CD137L in TNFSF9 to TAG, which is transcribed into an amber stop codon. The TAG in TNFSF9 can function as a codon for the fluorescent unnatural amino acid, L-Anap in the presence of Anap-specific tRNACUA/AnapRS (Lee et al., 2009; Summerer et al., 2006). Our aim was to visualize L-Anap-incorporated endogenous CD137L in living cells by fluorescence microscopy. Although the CRISPR-Cas9 technique produced the 2-base-edited TAG sequence in genomic TNFSF9, we found that the cDNA derived from it instead contained the wild-type triplet TCT, indicating that transcripts of the TAG sequence contained the codon AGA instead of CUA. This is the first report of re-editing (correcting) of transcripts follows programmable nuclease-mediated gene editing. Cells of the human hepatocyte carcinoma HepG2 cell line were cultured in αMEM/10% FBS in the presence of penicillin and streptomycin. Confluent cells were detached with trypsin/EDTA solution and diluted fourfold in fresh medium. For cryopreservation, 5 × 105 cells per vial were resuspended in 1ml CellBanker (AMS Biotech., UK) and stored at −70°C. Mutant HepG2 clones 9-1, 14 and 5 were cultured along with wild type cells with continuous sub-culture for more than one year. Point mutations of human TNFSF9 (19q13.3) were generated in Hep G2 cells as follows: first, programmable endonuclease activity of CRISPR-Cas9 was confirmed using T7 endonuclease 1 assays after transfecting the vectors for the guide RNA (pRGEN_U6_sgRNA) and Cas9 (pRGEN_Cas9_ CMV) into 293 T cells. sgRNAs containing PAM sequences were designed to target the nucleotides encoding Ser172 (ToolGen, Korea). After identifying a suitable sgRNA by confirming cleavage of the target sequence, pRGEN_U6_sgRNA and pRGEN_Cas9_CMV were cotransfected into Hep G2 cells along with a reporter plasmid and a double-stranded donor DNA containing the proto spacer region with right and left arms to mutate the second and third bases of TCT to TAG. The sequence of ds donor DNA was as follows: 5′gctcaggctccgtttcacttgcgctgcacctgcagccactgcgctAGgctgctg gggccgccgccctggctttgaccgtggacc-3′ (uppercase underlining indicates the mutation of Ser 172 to a stop codon). The RGEN target region (the 23mer proto spacer region) is in bold, and the left and right arms, are in lower case. The transfected cells were plated to form individual clones and clones with the desired triplet change were identified by isolating genomic DNA from random clones followed by PCR for TNFSF9 and DNA sequencing. Genomic DNA was isolated from HepG2 cells with a PureLink™ Genomic DNA Mini Kit (Invitrogen, USA) following the instruction manual. PCR was performed with Blend Taq polymerase (TOYOBO, Japan). PCR conditions and primers for amplification of TNFSF9 and the sgRNA plasmid are given in Table 1. PCR products were separated by running on 1.2% agarose gels. PCR amplicons of TNFSF9 (650 bp) were extracted with a gel-extraction kit and sequenced (Macrogen, Korea). Total RNA was isolated from HepG2 cells with Trizol RNA (Invitrogen, USA) and cDNA was synthesized with Accu-Power® CycleScript RT PreMix (Bionner, Korea) with 1 μg total RNA. PCR for TNFSF9 cDNA was performed with Accu-Power® PCR PreMix (Bionner, Korea). The primers and PCR conditions for TNFSF9 cDNA amplification are shown in Table 1. Using the Primer-Blast program, the primers were designed to span an exon-intron boundary. The PCR products were separated by running on 1.2% agarose gels. PCR amplicons of TNFSF9 cDNA (583 bp) were extracted with a gel-extraction kit, and the extracted DNAs were sequenced (Macrogen, Korea). Real-time PCR analysis (MiniOpticon, Bio Rad, USA) was performed using PCR Master Mix (Takara SYBR® PreMix Ex Taq II) to quantify expression of TNFSF9 mRNA (normalized to β-actin expression). Each sample was run in triplicate and threshold cycle (Ct) values were averaged. Expression of the gene of interest was quantified as ΔCt and normalized with the ΔCt of β-actin. Amplification specificity was confirmed in each run by analyzing the melting temperature of the PCR product. Negative controls were run without cDNA templates. cDNA synthesis and quantitative PCR were performed in triplicate. Newly synthesized RNA transcripts were isolated from existing RNA with a Click-iT® Nascent RNA Capture Kit (Molecular Probes, Eugene, OR). HepG2 cells were incubated with 500 ng/ml LPS in the presence of 5-ethynyl uridine (EU), an analog of uridine, for 16 hrs. EU-labeled RNA from total RNA was biotinylated and then isolated by binding to streptavidin magnetic beads. The RNA bound to the beads was used as a template for cDNA synthesis. cDNA was synthesized by AccuPower® CycleScript RT PreMix (Bionner, Korea) using 1 μg total RNA. PCR for TNFSF9 cDNA was done with AccuPower® PCR PreMix (Bionner, Korea). Primers and PCR conditions for TNFSF9 cDNA amplification are shown in Table 1. PCR products were separated by running on 1.2% agarose gels. PCR amplicons of TNFSF9 cDNA (583 bp) were extracted with a gel-extraction kit and sequenced (Macrogen, Korea). For T7 endonuclease 1 activity assay, PCR products were annealed and incubated with T7E1 (NEB, Ipswich, MA) according to the instruction manual. The T7E1-treated PCR products were separated on 1.2% agarose gels and visualized under UV. CRISPR-Cas9 was used with HepG2 cells to edit the 2nd and 3rd nucleotides of TCT in TNFSF9 to TAG, as described in Methods. 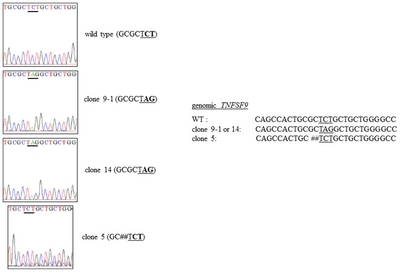 TCT was shown by DNA sequencing to have been changed to TAG in clones 9-1 and 14 (Fig. 1). To confirm that the edited TAG in the TNFSF9 gene of clone 9-1 and clone 14 was correctly transcribed to CUA, an amber stop codon, TNFSF9 cDNA was amplified and sequenced from total RNA from clone 9-1 and 14. As shown in Fig. 2, the TNFSF9 cDNA actually contained the wild-type triplet TCT, indicating that the mutant triplet in TNFSF9 was being re-edited to AGA during transcription. In addition, 1 or 2 bases just before TCT were deleted in the TNFSF9 transcript (Fig. 2). On the other hand, the TNFSF9 transcript made from the clone 5 deletion mutant cells was itself mutant, as expected (Fig. 2). These data indicate that RNA editing occurs during transcription of TNFSF9 in clone 9-1 and 14 cells. To examine if newly synthesized TNFSF9 transcripts in clone 9-1 cells were edited, EU-labeled RNA was isolated from mutant cells treated with LPS and TNFSF9 cDNA was amplified and sequenced. Incubation of HepG2 clone 9-1 cells with LPS for 16 h strongly up-regulated TNFSF9 transcription (Fig. 3A) and sequencing of cDNA made from the EU-labeled transcripts again revealed re-editing of the transcripts to AGA. However, unlike in the case of the steady-state RNA, mixed peaks of TNFSF9 cDNA were seen in the region of the triplet of interest (Fig. 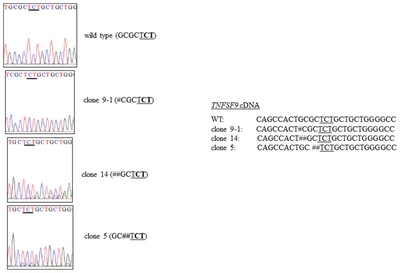 3B), pointing to the presence of two indel TNFSF9 cDNA PCR products in the region of the edited bases. To confirm the presence of these two indels, the TNFSF9 cDNA PCR products were annealed and treated with endonuclease T7E1. As shown in Fig. 4, TNFSF9 cDNA PCR products from EU-labeled transcripts were susceptible to T7E1 nuclease whereas those from total RNA were not, indicating that the TNFSF9 cDNA PCR products from the EU-labeled transcripts were imperfectly matched. These data again indicate that the TNFSF9 mRNA transcribed from the edited genomic TNFSF9 DNA was being re-edited in the process of transcription. The data in this study clearly show that editing of genomic nucleotides by CRISPR-Cas9 can be followed by re-editing during transcription. It is likely that the sgRNA used in the initial editing is involved in this re-editing, acting as a template for re-editing the TNFSF9 mRNA. Both the sgRNA plasmid and the Cas9 plasmid may have been retained in clone 9-1 and clone 14 even though it was continuously sub-cultured for a year. The plasmids may have been incorporated at random sites in the genome, and sgRNA transcript/Cas9 protein may be being continuously expressed. This interpretation is supported by our finding that the genomic DNA of clone 9-1 contained the sgRNA plasmid whereas that of wild type cells did not (Fig. 5). CRISPR-Cas9 has not been shown to be involved in any RNA (re-) editing but RNA editing has been reported in other CRISPR-Cas systems (Cox et al., 2017; Kable et al., 1996). The mechanism(s) by which RNA re-editing occurs after DNA editing remains to be established. However, the findings of this study may act as a warning to researchers that undesirable target RNA re-editing can follow “correct” editing of target genes by CRISPR-Cas9. Fig. 1. The TNFSF9 genes in genomic DNAs from wild type and mutated HepG2 cells were amplified by PCR. The PCR products were isolated and sequenced as described in “Materials and Methods”. Left panels are chromatograms of the genomic TNFSF9 sequence. On the right are shown the DNA sequences around the region of the mutated triplet in the wildtype and mutant clones. This is one representative of five independent experiments. Fig. 2. TNFSF9 cDNA was synthesized and amplified by PCR from total RNA extracted from wild type and mutated HepG2 cells. The PCR products were isolated and sequenced as described in “Materials and Methods”. Left panels are chromatograms of the TNFSF9 cDNA sequences. On the right are shown the cDNA sequences around the region of the mutated triplet in the wild type and mutant clones. This is one representative of four independent experiments. Fig. 3. (A) HepG2 clone 9-1 cells were incubated with 500 ng/ml LPS for the indicated times. cDNA was synthesized from total RNA, and TNFSF9 expression was quantified by real-time PCR as described in “Materials and Methods”. (B) HepG2 cells were incubated with 500 ng/ml LPS in the presence of 5-ethynyl uridine (EU) for 16 hrs. EU-labeled RNA was isolated as described in “Materials and Methods”. TNFSF9 cDNA was amplified by PCR and the PCR products were isolated and sequenced. This experiment is representative of four independent experiments. Fig. 4. Total RNA and EU-labeled RNAs were isolated from clone 9-1 HepG2 cells. cDNA was synthesized and the TNFSF9 cDNA was amplified by PCR as described in “Materials and Methods”. The PCR products were annealed and incubated in the presence or absence of T7E1 endonuclease, and the products were fractionated on 1.2% agarose gels and visualized under UV. This is one representative of three independent experiments. Fig. 5. The sgRNA plasmid sequence was amplified by PCR from genomic DNA of wild type and clone 9-1 HepG2 cells, as described in “Materials and Methods”. The PCR products were fractionated on a 2% agarose gel and visualized under UV. This is one representative of three independent experiments. Baltimore, D., Berg, P., Botchan, M., Carroll, D., Charo, R.A., Church, G., Corn, J.E., Daley, G.Q., Doudna, J.A., and Fenner, M. (2015). Biotechnology. A prudent path forward for genomic engineering and germline gene modification. Science. 348, 36-38. Bibikova, M., Golic, M., Golic, K.G., and Carroll, D. (2002). Targeted chromosomal cleavage and mutagenesis in drosophila using zinc-finger nucleases. Genetics. 161, 1169-1175. Bibikova, M., Beumer, K., Trautman, J.K., and Carroll, D. (2003). Enhancing gene targeting with designed zinc finger nucleases. Science. 300, 764. Boch, J., Scholze, H., Schornack, S., Landgraf, A., Hahn, S., Kay, S., Lahaye, T., Nickstadt, A., and Bonas, U. (2009). Breaking the code of DNA binding specificity of TAL-type III effectors. Science. 326, 1509-1512. Choulika, A., Perrin, A., Dujon, B., and Nicolas, J.F. (1995). Induction of homologous recombination in mammalian chromosomes by using the I-SceI system of Saccharomyces cerevisiae. Mol Cell Biol. 15, 1968-1973. Cong, L., Ran, F.A., Cox, D., Lin, S., Barretto, R., Habib, N., Hsu, P.D., Wu, X., Jiang, W., Marraffini, L.A., and Zhang, F. (2013). Multiplex genome engineering using CRISPR/Cas systems. Science. 339, 819-823. Cox, D.B.T., Gootenberg, J.S., Abudayyeh, O.O., Franklin, B., Kellner, M.J., Joung, J., and Zhang, F. (2017). RNA editing with CRISPR-Cas13. Science. 358, 1019-1027. Davis, K.M., Pattanayak, V., Thompson, D.B., Zuris, J.A., and Liu, D.R. (2015). Small molecule-triggered Cas9 protein with improved genome-editing specificity. Nat Chem Biol. 11, 316-318. Deveau, H., Barrangou, R., Garneau, J.E., Labonté, J., Fremaux, C., Boyaval, P., Romero, D.A., Horvath, P., and Moineau, S. (2008). Phage response to CRISPR-encoded resistance in streptococcus thermophilus. J Bacteriol. 190, 1390-1400. Doudna, J.A., and Charpentier, E. (2014). Genome editing. The new frontier of genome engineering with CRISPR-Cas9. Science. 346, 1258096. Garneau, J.E., Dupuis, M.È., Villion, M., Romero, D.A., Barrangou, R., Boyaval, P., Fremaux, C., Horvath, P., Magadán, A.H., and Moineau, S. (2010). The CRISPR/Cas bacterial immune system cleaves bacteriophage and plasmid DNA. Nature. 468, 67-71. Gasiunas, G., Barrangou, R., Horvath, P., and Siksnys, V. (2012). Cas9-crRNA ribonucleoprotein complex mediates specific DNA cleavage for adaptive immunity in bacteria. Proc Natl Acad Sci USA. 109, E2579-E2586. Hsu, P.D., Lander, E.S., and Zhang, F. (2014). Development and applications of CRISPR-Cas9 for genome engineering. Cell. 157, 1262-1278. Jasin, M. (1996). Genetic manipulation of genomes with rare-cutting endonucleases. Trends Genet. 12, 224-228. Jeggo, P.A. (1998). DNA breakage and repair. Adv Genet. 38, 185-218. Jinek, M., Chylinski, K., Fonfara, I., Hauer, M., Doudna, J.A., and Charpentier, E. (2012). A programmable dual-RNA-guided DNA endonuclease in adaptive bacterial immunity. Science. 337, 816-821. Kable, M.L., Seiwert, S.D., Heidmann, S., and Stuart, K. (1996). RNA editing: a mechanism for gRNA-specified uridylate insertion into precursor mRNA. Science. 273, 1189-1195. Kim, D.K., Lee, S.C., and Lee, H.W. (2009). CD137 ligand-mediated reverse signals increase cell viability and cytokine expression in murine myeloid cells: Involvement of mTOR/p70S6 kinase and Akt. Eur J Immunol. 39, 2617-2628. Kim, E.C., Moon, J.H., Kang, S.W., Kwon, B., and Lee, H.W. (2015). TMEM126A, a CD137 ligand binding protein, couples with the TLR4 signal transduction pathway in macrophages. Mol Immunol. 64, 244-251. Komor, A.C., Kim, Y.B., Packer, M.S., Zuris, J.A., and Liu, D.R. (2016). Programmable editing of a target base in genomic DNA without double-stranded DNA cleavage. Nature. 533, 420-424. Komor, A.C., Badran, A.H., and David, R.L. (2017). CRISPR-Based technologies for the manipulation of eukaryotic genomes. Cell. 168, 20-36. Koo, T., Lee, J., and Kim, J.S. (2015). Measuring and reducing Off-Target activities of programmable nucleases including CRISPR-Cas9. Mol Cells. 38, 475-481. Lee, H.W., Park, S.J., Choi, B.K., Kim, H.H., Nam, K.O., and Kwon, B.S. (2002). 4-1BB promotes the survival of CD8(+) T lymphocytes by increasing expression of Bcl-x(L) and BfI-1. J Immunol. 169, 4882-4888. Lee, H.S., Guo, J., Lemke, E.A., Dimla, R.D., and Schultz, P.G. (2009). Genetic incorporation of a small, environmentally sensitive, fluorescent probe into proteins in Saccharomyces cerevisiae. J Am Chem Soc. 131, 12921-12923. Li, T., Huang, S., Jiang, W.Z., Wright, D., Spalding, M.H., Weeks, D.P., and Yang, B. (2011a). TAL nucleases (TALNs): hybrid proteins composed of TAL effectors and FokI DNA-cleavage domain. Nucleic Acids Res. 39, 359-372. Li, T., Huang, S., Zhao, X., Wright, D.A., Carpenter, S., Spalding, M.H., Weeks, D.P., and Yang, B. (2011b). Modularly assembled designer TAL effector nucleases for targeted gene knockout and gene replacement in eukaryotes. Nucleic Acids Res. 39, 6315-6325. Lin, F.L., Sperle, K., and Sternberg, N. (1985). Recombination in mouse L cells between DNA introduced into cells and homologous chromosomal sequences. Proc Natl Acad Sci USA. 82, 1391-1395. Mali, P., Aach, J., Stranges, P.B., Esvelt, K.M., Moosburner, M., Kosuri, S., Yang, L., and Church, G.M. (2013). CAS9 transcriptional activators for target specificity screening and paired nickases for cooperative genome engineering. Nat Biotechnol. 31, 833-838. Ran, F.A., Hsu, P.D., Lin, C.Y., Gootenberg, J.S., Konermann, S., Trevino, A.E., Scott, D.A., Inoue, A., Matoba, S., and Zhang, Y. (2013). Double nicking by RNA-guided CRISPR Cas9 for enhanced genome editing specificity. Cell. 154, 1380-1389. Shao, Z., and Schwarz, H. (2011). CD137 ligand, a member of the tumor necrosis factor family, regulates immune responses via reverse signal transduction. J Leukocyte Biol. 89, 21-29. Summerer, D., Chen, S., Wu, N., Deiters, A., Chin, J.W., and Schultz, P.G. (2006). A genetically encoded fluorescent amino acid. Proc Natl Acad Sci USA. 103, 9785-9789. Wang, C., Lin, G.H., McPherson, A.J., and Watts, T.H. (2009). Immune regulation by 4-1BB and 4-1BBL: complexities and challenges. Immunol Rev. 229, 192-215.